In anticipation of the upcoming release of the soundtrack album from the popular NBC Universal TV show ‚ÄúHeroes‚Äù, the program’s executive producer and director Allan Arkush has created a series of five music video podcasts that will be available exclusively from the Zune Marketplace. 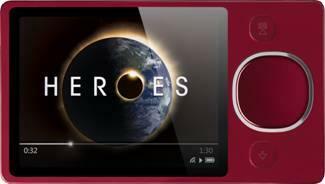 Each video short features “Heroes” footage set to select tracks from the album. Nada Surf’s “Weightless” provides the soundtrack to the first video, which debuts today on the Zune Marketplace and MSN. Four additional music video podcasts will be published on Zune Marketplace between now and the soundtrack album’s release on March 18. The podcasts will feature new releases ‚ÄúHe’s Frank‚Äù by Brighton Port Authority featuring Iggy Pop, ‚ÄúNot Now But Soon‚Äù by Imogen Heap and ‚ÄúKeeping My Composure‚Äù by The Chemical Brothers featuring Spank Rock, as well as ‚ÄúMan In The Long Black Coat‚Äù by Bob Dylan. ‚ÄúThis podcast series is part of our plan to make more original content available via Zune Marketplace,‚Äù said Richard Winn, director of entertainment development for Zune. The direct link to the podcast is here.